Someone just let slip loose on the internet all of the details for the changes we'll see to the entire 2009 Porsche 911 lineup, including the accompanying information on when that data was supposed to be released. Let's just say that in some cases, this info isn't supposed to see the light of day for months. Of course after this bit of seepage, we're pretty sure those dates are going to move up. So, how is the new 2009 911 different from the 2008 Porsche 911? Well, to start with, the new generation of engines under the new 997's hood will get direct fuel injection, resulting in a decent pop in horsepower. The 3.6-liter boxer engine will see a 20 HP boost, to a total of 345 HP. We'll also see a 30 HP increase for the 3.8-liter boxer, bringing that engine's total to 385 horses. It's not just the engine that'll get an upgrade. The documents also tell us the exterior of the new 911 — from Carrera to Targa 4 — should see changes, including a new front bumper with larger air intakes and lights, semi-integrated stainless steel tailpipes and a new rear bumper. 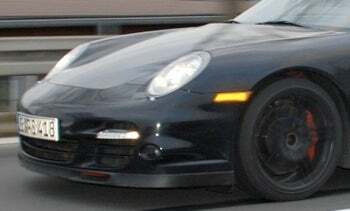 On the chassis side, the 3.6-liter models will be getting revised brakes and Carrera models will receive new wheels. But wait, wait, there's more. There's also an enhanced version of the Porsche Stability Management (PSM) now available with additional functions on the Carrera models and a new braking system for the 3.6-liter models including thicker brake discs on the front and rear tires — 12 mm thicker in the front and 31 mm thicker in the rear to be exact. We're also told we'll see a mechanical limited-slip diff as a standard for Targa 4 and Carrera 4 models and a 7-speed PDK transmission, which would be a sequential two-shaft transmission — just like the Nissan GT-R. Production actually started this week on the Carrera Coupe and Cabrio, with both going on sale stateside in September of this year and the new 2009 911 Carrera 4 going on sale worldwide in late October.